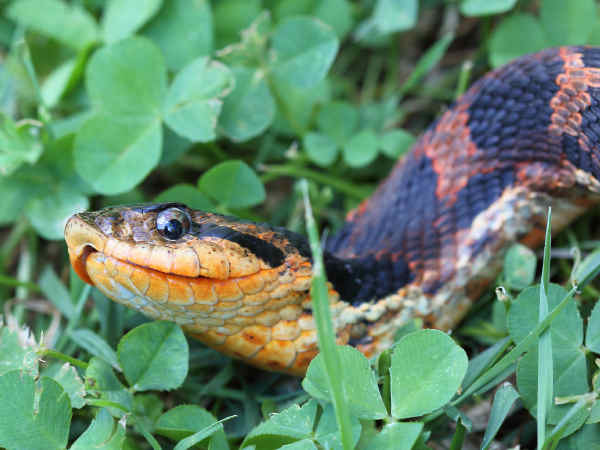 This section of the snake identification guide deals with Hognose Snakes. Please press the green Snakes button to learn about additional kinds of snakes. They are characterized as having thick bodies that can grow to four feet in length. Together the three species cover most of the territory of the continental United States. Any large snake can be imposing. When faced with potential danger, the snake snake inhales air to enlarge its head and neck and feign striking. That behavior explains a common nickname, the puffed adder. Even more remarkable, Hognose snakes don’t usually follow through on their threat. Instead they opt to roll over and play dead. So there’s little for humans to fear. 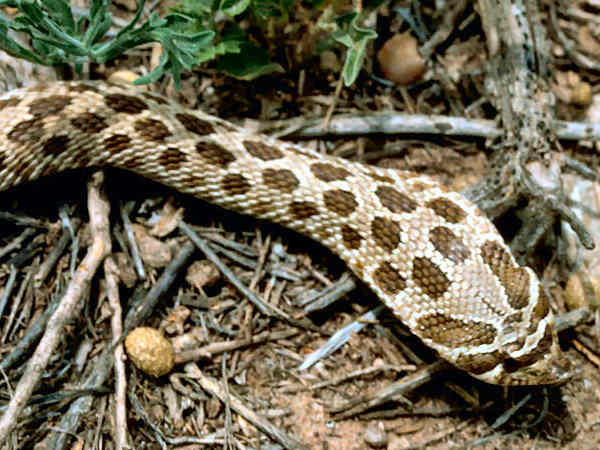 Habituation in captivity causing loss of the death-feigning behavior has made it difficult to study the circumstances under which hognose snakes death-feign. Human presence has been used as a proxy for predator threat in other studies of snake behavior. Eastern Hognose snakes (Heterodon platirhinos) can assume a variety of colors. The picture shows a snake with a yellow background color. The pattern of dark spots down the back is another helpful field identification clue. While they are the common species in the eastern half of the United States, in many areas, especially the Northeast, they get categorized as a species in need of conservation, primarily because of habitat destruction. Again little research has been done on the species, but their habitat preferences appear to be sandy soils and soft soils. Females dig in the ground to lay their eggs. Southern hognose snakes share overlapping territory with the Eastern Hognose. Color is one way to differentiate between the two species. Generally the Southern Hognose have light gray or tan bodies with the darker pattern covering them. Their range has narrowed and now is confined to some areas along the Southeast. Western Hognose snakes have a most consistent body color. The background color ranges from tan to a darker brown. Dark patterns cover the body.